Academic historian Jaya Jones had been looking forward to a free trip to Kyoto, Japan, courtesy of her best friend Sanjay Rai’s opening performance for a famous Japanese stage magician. Sanjay is known for being dramatic, but Jaya is alarmed when he calls her to disinvite and warn her away. A follow-up call does little to clarify the situation, and with a research request tied to Dutch and Japanese trade, it’s not long before Jaya is indeed on a plane to Japan. Thus begins an adventure that will involve ninjas, a fox spirit, historical diaries, and seriously, ninjas! The secret behind illusions are heavily guarded by magicians, as much from one another as from their general audience. The Indian Rope Trick has baffled magicians for centuries, but Akira Kimura claims to have found the secret and plans to replicate the gruesome performance. The former popstar’s cult-like following places him at odds with Sanjay’s friend and mentor, Hiro Matsumoto, who has dedicated his life to exposing frauds. When Akira is found dead at what was to be the site of his performance, Hiro is seen as a suspect by both the police and a heart-broken Sanjay. Misdirection is the name of the game for historians as well as illusionists, leaving much to interpretation for the curiosity-driven Jaya. With Sanjay driven to complete the performance despite the risks, Jaya, her librarian friend Tamarind Ortega, and an adorable ninety-year-old Frenchman track a mysterious diary, dodge shinobi, and explore the complicated history of Japanese isolationists and trade restrictions. This continues to be one of the most interesting and exciting mystery series written today. History is woven throughout Jaya’s treasure-hunting adventures, which often start out academically but seem to result with death-defying escapades. Part-Indian and raised in Berkeley, California, Jaya provides a unique perspective on culture and not always fitting in. Similarly fascinating is her love of history, and how the personal dramas written in documents come alive when they connect the past to the present. As intriguing as the Japanese myths and intricate trade regulations may be, Jaya puts them aside as she confronts life-changing decisions. She ended her relationship with Lane Peters when she discovered that she was actually enjoying her death defying adventures, and she’s taking a break to assess her future. A kiss she shared with Sanjay further complicates matters, but first she must ensure that the Hindi Houdini’s greatest illusion doesn’t become his last. 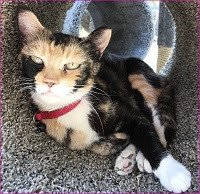 Jaya is a delightful heroine, full of spunky humor, intelligence, and loyalty to her friends. 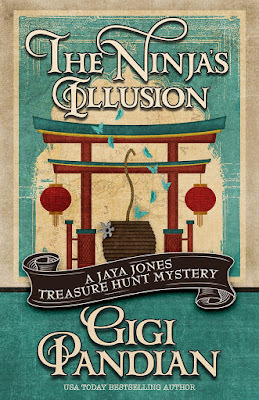 Modern-age magic, the study of Eastern history, and the romantic lure of treasure hunting all combine into a thoroughly entertaining romp of a mystery. 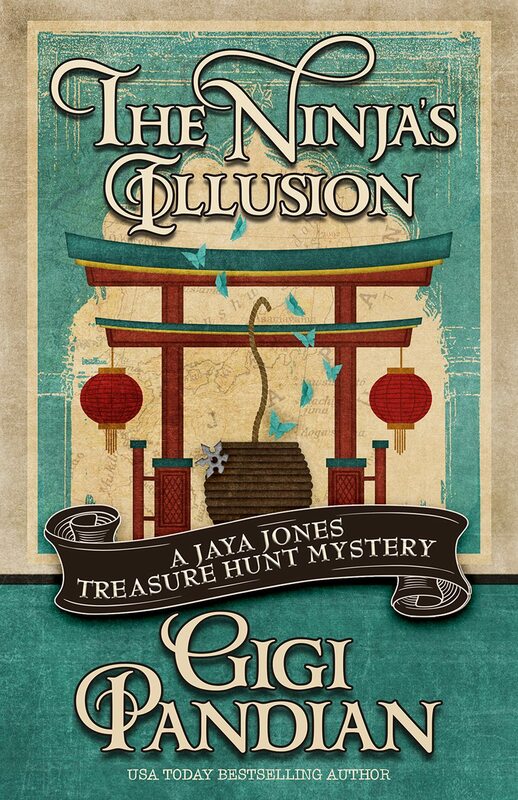 To enter to win a copy of The Ninja’s Illusion, simply email KRL at krlcontests@gmail[dot]com by replacing the [dot] with a period, and with the subject line “ninja,” or comment on this article. A winner will be chosen December 2, 2017. U.S. residents only. If entering via email please included your mailing address. If entering via comment please be sure to include your email address. It sounds like a great read, which is what I've come to expect from Gigi. Thanks for the delightful review, Cynthia. I always look forward to your reviews as I find them as well written as the books I read. Gigi is a new author to me. I really liked the description of the book and would like to read.